With the recent resurgence in popularity of both Doctor Who and Sherlock Holmes, two of Great Britain’s greatest cerebral heroes, there has been a public yearning for the two franchises to cross over and intersect. 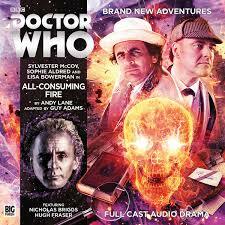 As Big Finish’s latest novel adaptation is keen to remind enthusiasts, though, this seeming impossibility already gloriously happened in 1994’s ‘All-Consuming Fire’ by Andy Lane during the height of The New Adventures range. The audio adaptation is very faithful to the source material and will no doubt please those with an open mind, though, understandably, the notion of having Sherlock Holmes deal with aliens may upset Holmesian purists and the notion of having a Doctor Who adventure unfold through the first-person journal narration of Doctor Watson- and in some instances Bernice- may prove somewhat disconcerting for Doctor Who purists. However, the decision to tell the tale as a Holmes mystery that the Doctor and his companions happen to wander into works incredibly well and adds an air of Conan Doyle authenticity while the mystery unfolds in a very unique manner. Indeed, beginning the story with Big Finish’s Sherlock Holmes theme sets the scene for what is to come and, though some of the original content has been omitted or slightly altered to make the overall narrative more streamlined and accessible for all audiences, all of the characters come to life exceedingly well and make the strange mystery a pleasure to once more experience. In some respects, it’s surprising that this type of crossover hasn’t happened more frequently. As it is, Nicholas Briggs is strong as he brings his well-practiced Holmes into altogether more extraordinary circumstances, imbuing a sort of arrogance and frustrated brilliance so in line with the classic writings of the character. Thus, while investigating the disappearance of deemed-dangerous books from The Library of St John the Beheaded at the Pope’s request, he is willing and able to take the Doctor’s introduction to fascinating alien concepts and worlds in stride while humorlessly being unable to read anything about the Doctor himself. At the same time, Richard Earl brings a gentlemanly kindness to balance out Holmes’s frequent aloofness, and the innate chemistry between the two shines throughout. ‘All-Consuming Fire’ makes good use of its historical setting both in terms of locations across the globe and with Bernice needing to adopt the guise of a man to better fit in without scorn. Without ever losing its pace or direction, the complex plot effortlessly introduces Baron Maupertius and his plan to expand the British Empire beyond the Earth itself, deftly tying in the mysterious elder brother of Sherlock, Sherringford, along the way. The motivation behind the plan becomes a little muddled because of the condensed running time of the audio version, and the Lovecraftian component sadly isn’t fully realized as Azathoth becomes known. Nonetheless, the ambition on display is superb, and the scope of the true villainy and subversion has lost nothing in the transition. It’s a testament to the story in both mediums that Holmes and Watson remain so central to the action even when the plot veers into distinctly Doctor Who territory. Even with Ace distinctly sidelined and her characterization a bit too like the earlier Ace of The New Adventures than the later, the interactions between both franchises’ leads are truly outstanding and easily carry the adventure from beginning to end. The resolution and denouement are a bit too crowded due to the sheer number of characters and plotlines, but it’s a small concession that could never really be avoided after the furiously-paced adventure before it. Maybe not one for the purists, ‘All-Consuming Fire’ is still a staggering success and delivers on all fronts for those looking for a grand mystery and adventure full of intrigue and surprises.